But Eating Healthy is So Darn Expensive… Isn’t it? Home /Health and Diet/But Eating Healthy is So Darn Expensive… Isn’t it? Eating healthy nowadays does not have to be expensive. In fact, it can be cheaper and far less complicated than preparing food out of a box. By keeping your refrigerator and pantry stocked with a few inexpensive, basic ingredients, you can save yourself a lot of heartache in the kitchen (not to mention saving a few bucks, too), and at the same time, become a healthier, more self-sufficient individual. Let’s begin by looking at the alternative to cooking your meals from scratch. Or, what I like to call: “Why boxed food stinks.” There are three main reasons “why boxed food stinks.” The first reason to consider is the health factor. When was the last time you read the ingredients on a package of food you bought? Okay, when was the last time you could actually pronounce the ingredients on that package, or for that matter, had any idea what those seemingly foreign words meant? Ingredients like disodium inosinate, ferric orthophosphate, silicon dioxide, mixed triglycerides, Red 40, Yellow 5, partially hydrogenated soybean oil, and monosodium glutamate (MSG)… What is this stuff, really? It doesn’t sound like food, and it certainly doesn’t sound healthy. If all of these added ingredients are supposed to save me time, then I say no thanks, I’ll save a little money and possibly a few years of my life and buy some basic real food ingredients. The second problem with boxed food is the price. For the amount of actual food you are buying (as opposed to how many servings it provides after being reconstituted with water and/or other additional ingredients you have to buy), you end up paying more money for substandard food. For example, a 10 lb. bag of potatoes costs $2.48 at our local grocery store. On the other hand, a 1 ¾ lb. box of instant mashed potatoes costs $3.90. Even after adding the appropriate amount of water to reconstitute the potato flakes, you still only get 3 ½ pounds of instant mashed potatoes. In this case, the boxed “potatoes” cost almost 3 times as much as the real deal. Let’s talk about inexpensive, healthy alternatives to lunch meat. This year, shortly after New Year’s, I bought a 10 lb. ham for about $15.00. After much cutting and slicing, I filled approximately 5 sandwich bags full of thick slices of ham, several more bags with various sized chunks of ham, I bagged up the ham bone with the surrounding meat attached, and I even melted down some of the fat and placed it in a jar. For the next several months, we ate delicious ham sandwiches, eggs scrambled with pieces of ham, vegetables sautéed with ham, a tasty split pea soup made with the ham bone, and homemade biscuits covered with ham gravy. You could also buy a frozen turkey just after the holidays for the same purpose, for a comparably discounted price. If you have a large freezer, you could buy several hams and/or turkeys at once, and use them all year long. The “boxed food” equivalent of ham sliced off the bone is pre-sliced, packaged lunch meat, loaded with preservatives, nitrates and nitrites, and don’t forget the added water. At the same grocery store where I bought the ham, I spotted a 6 oz. package of sliced ham for $2.23. So, let’s compare prices. I paid $15.00 for 10 lbs. and 10 lbs. = 160 oz. which equates to $1.00 for every 10 oz. or so. If you buy a 6 oz. package of lunchmeat for $2.23, then you are paying about four times as much, just to have someone else slice your meat and add preservatives and water to it. Here are a few more examples of products that people commonly buy. Item A: Sliced Cheese. A 6 oz. package of sliced cheese costs $2.25 at my local grocery store. For about the same price, you can buy a 2lb. block of cheese, slice it to whatever thickness you prefer (I love cheese whereas my husband prefers a very thin slice), and refrigerate the slices in a plastic baggy to be used in sandwiches all week long. Item B: Applesauce. A jar of store bought applesauce containing 2 ½ cups costs $1.80. Two Fuji apples at my local grocery store made 2 ½ cups of applesauce for only 74 cents. Item C: Chicken Breasts. A package of zesty lemon and herb chicken breasts costs $5.18 per lb. A whole young chicken (not frozen) costs $1.28 per pound. I save almost $4.00 a lb. just by carving up and seasoning my own chicken! That’s what I call getting more cluck for your buck! My apologies for the super-corny joke. In all seriousness though, I think I’ve made my point about boxed food being more expensive. The third strike against boxed food is that preparing it is actually more complicated than making a home cooked meal from scratch. The components of a homemade meal are simple: someone grows the food (possibly you), you cook the food, and you eat the food! My mantra is: Eat what you want, eat what you have. This means that I buy the foods I like and I make meals out of them. Instead of starting with a recipe, start with the ingredients. You’ll never go wrong! Besides always having the right ingredients, with home cooked meals, you’ll always have the right-sized pot or pan, because you are the one choosing the amount of food in the dish. There were countless times in my “boxed food days” when I would pull down a boxed food from the cupboard, read the directions on the back, take out all of the required added ingredients (it was a rare occurrence when I had every single ingredient), and then mix every ingredient together in just the right sequence, only to discover that I did not own a 9”x 9”x 2” baking dish with matching oven-proof lid. Often times, I would try to “make it work” with a different pan, or perhaps a little tin foil, or in desperate times: “I wonder if this will cook up in the microwave?” But usually, despite my best and most creative efforts, the meal would not turn out looking like the picture on the box, and more often than not, it would end up in the trash, with me on the phone ordering a large pepperoni and sausage with extra grease, please. So, I keep it simple, and cook from scratch. Cooking meals from scratch entails using basic food ingredients. I would define something as a basic food ingredient if it has not been added to or altered, or even better, something that comes straight from the grower with minimal or no processing. These are things like milk, butter, eggs, apples, bananas, lemons, corn, green beans, potatoes, lettuce, garlic, onions, flour, honey, salt, oats, dried beans, nuts, a block of cheese, a whole chicken or turkey, etc. These are some basic ingredients that are commonly found in my kitchen, which I use to make a variety of tasty, homemade meals. When planning my family’s meals, I try to include something from each food group, so I’ve developed an ideal meal design for breakfasts, lunches, snacks, dinners, and desserts. With the food pyramid in mind, I will serve for breakfast: a grain, a protein, a fruit, and water. For lunch I serve a grain, a protein, a veggie, and water. As a snack, we eat either a grain, a protein, or a fruit, depending on the mood. Dinner has the same components as lunch, and for dessert, we will usually have a fruit or a sweet such as frozen yogurt or homemade cookies. For breakfast I will usually fry up an egg or two for each family member, in addition to some toast, some cut fruit, a steaming pot of sweet, creamy oatmeal, and a glass of milk, water, or fresh juice. Lunch at our house usually consists of some type of protein sandwiched between two slices of homemade whole wheat bread, with a side of cooked or raw vegetables, and a glass of milk or water. Sometimes we make sandwiches with a nut butter and fruit preserves or honey. Other times they have a slice of ham/turkey with lettuce, tomato, onion, mustard, fresh ground pepper, and a slice of our favorite cheese. Occasionally I use leftover chicken pieces to make up a chicken salad, which we eat on a sandwich, or scoop up with homemade crackers as a snack. Almost anything is up for grabs as a snack, since it depends on the snacker’s mood. We have been known to eat any of the following as snacks in our house: homemade crackers, a piece of fruit, a few chunks of cheese, some nuts and dried fruit, a few slices of ham/turkey, a slice of homemade bread spread with a nut butter, or occasionally some fruit and yogurt blended into a smoothie. For our grain, I will usually serve homemade rolls, sliced bread, biscuits, or cornbread, lightly drizzled with honey or butter; I also occasionally serve whole wheat pasta as our grain. For our protein, I will make homemade meatballs, baked chicken, beef strips, or pieces of pork, all of which can be cooked with any type of vegetable right in the same pan, or separately. I sometimes prepare a super-easy dinner salad instead of cooking a vegetable dish, paired with an equally easy homemade vinaigrette. 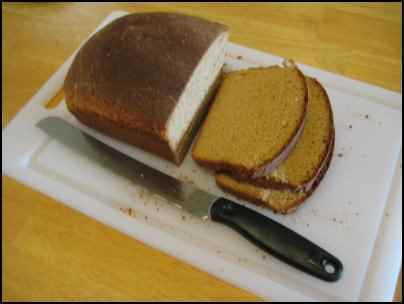 A delicious and healthful food that my family cannot live without is homemade whole wheat bread. We’ll never go back to store bought! I can hear the housewives groan in unison: “Ugh, I don’t have time to bake homemade bread! Not to mention, I don’t have any fancy, expensive mixers or bread machines. I could never do that!” It is actually pretty simple to bake your own delicious bread right at home, without any of those expensive mixers or the like. It takes me about an hour and a half to make my bread using a large bowl and wooden spoon to mix and my hands to knead. This includes rising and baking time! Now, if you don’t have a two year old who won’t keep his hands out of the flour and a six month old crying to nurse right when you’ve got your hands good and doughy in the middle of kneading, then it shouldn’t take you longer than an hour and fifteen minutes tops. From one batch of dough, I get two hearty loaves, which I slip into bread bags and close with a twist-tie (about $3.00 for a box of 75 Safeway brand bags), then I pop one into the freezer for later in the week, and set one on top of the fridge, sliced and ready to become sandwiches. For years I bought packaged chicken breasts. Then a friend showed me how easy it is to bake an entire chicken at once, with hardly any prep work. I added my own touch by cooking the veggies alongside the chicken, in the same casserole dish. Here’s how I do it: After rinsing a thawed chicken and removing its innards, place it breast side down in a large casserole dish. This makes the breasts tender and juicy. Add a few cups of water to the dish, along with some chopped vegetables of your choice; remembering to place some of the veggies into the chicken cavity (this will give them excellent flavor.) I like to use chopped onions, carrots and potatoes. Another delicious thing you can do is to cut slits into the chicken in various places, and stuff cloves of garlic into the slits. 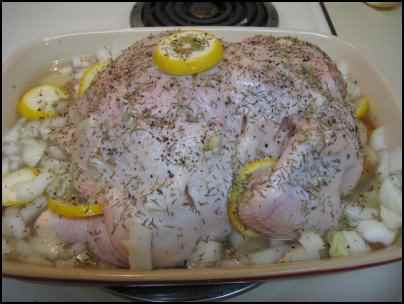 Finish by sprinkling salt, fresh cracked pepper, and any other herbs of your choice over the chicken, then bake @ 350 degrees for about an hour. After dinner, you can drain off the liquid for a delicious chicken broth. It’s so easy—an entire meal in one dish! Homemade applesauce is very easy to make. I use a potato peeler to remove the skins, chop the apples into small chunks, then toss them into a pot with a little water to simmer on low heat for a couple of hours. 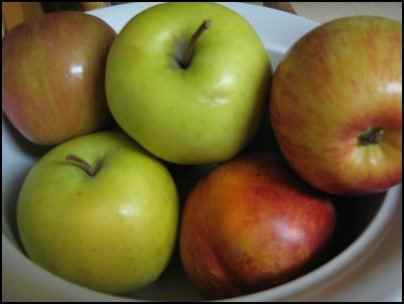 I sometimes add cinnamon, but I never add sugar, because apples are naturally quite sweet. If you don’t like your applesauce chunky, then you can run it through the blender. If you can make homemade mashed potatoes, then you’ve got this covered; it is the same thing, except you use much less water, a lower heat, and you don’t have to drain anything afterwards. Sweet and simple! Now that I’ve described in great detail all of my supermarket research, methods, mantras, and recipes, I hope I’ve inspired some people to become healthier, do-it-yourselfers in the kitchen, who get the added bonus of saving a little green. Homesteading is about self-sufficiency and simple living. What better way to live out these principles in your home, than taking food in its most basic forms, and learning how to prepare it yourself? I believe this to be true for both the full-time homesteader who grows all of their own food and the homesteader at heart, like me, who leaves their cramped city apartment and walks to the nearby grocery store to buy some fresh produce.